U.S. aid to North Korea: Is food aid culturally specific? Is Food Aid Culturally Specific? What kinds of dishes does the U.S. send to North Korea? Photograph by Adek Berry/AFP/Getty Images. Following a thaw in North Korea’s nuclear program, the U.S. has announced it will resume food aid to the nutrient-starved country. The aid package, which amounts to 240,000 metric tons per year, would include monthly deliveries of vegetable oil and corn-soy blend, as well as “therapeutic foods” designed to fortify children and pregnant women, such as nutritionally enhanced peanut paste. In August 2010, Juliet Lapidos asked whether food aid from the United States was always culturally specific. Her original article is printed below. Catastrophic, monsoon-induced flooding in Pakistan has killed an estimated 1,300 to 1,600 people and displaced millions. The United Nations has asked for $460 million to provide basics like shelter, clean water, and food. Are emergency food rations culturally specific? Yes. The United Nations World Food Program tries to provide disaster victims daily rations of 2,100 Kcal per person, including 58 grams of protein and 43 grams of fat, using local ingredients where possible. A typical “relief basket” contains fortified vegetable oil, pulses (often kidney beans, chickpeas, or lentils), sugar, salt, and grain. The type of grain depends on the region’s traditional dietary habits. In Pakistan the U.N. is distributing wheat flour to bake bread; if there were an emergency in Kenya or Nigeria, it would likely supply maize. In the days immediately following a disaster, stove-tops and the like may be scarce, so the food program distributes premade fortified wheat biscuits, as well as “culturally appropriate” ready-to-eat meals. When Israel invaded Gaza in February 2009 the organization gave out canned meat, chicken curry, and cheese. To prevent malnutrition, children get little tubs of mashed food. In Pakistan the U.N. is giving kids chickpea paste; after the earthquake in Haiti, kids got “supplementary plumpy”: a peanut paste with vegetable fat, soy protein, whey, sugar, and cocoa, plus added vitamins. Other aid organizations follow the U.N.’s menu of basic ingredients with regional inflections. The development organization BRAC is delivering food packets in Pakistan bought from local markets that contain rice, lentils, wheat flour, and water purification tablets. When cyclone Aila hit Bangladesh in 2009, the same organization distributed lentils and wheat flour but also puffed rice mixed with molasses. 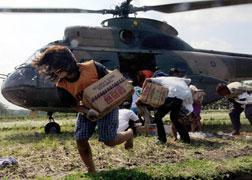 Relief organizations and national governments might also choose to give whatever foods they have on hand. After Katrina, the United Kingdom flew half a million ration packs for the British military to the southern disaster zone. These included French onion soup, curried lamb, fruit dumplings in custard, and hot pepper sauce, among other items. Explainer thanks Marcus Prior of the U.N. World Food Program.